City U classmates in the back of the fire truck before our short demonstration ride. 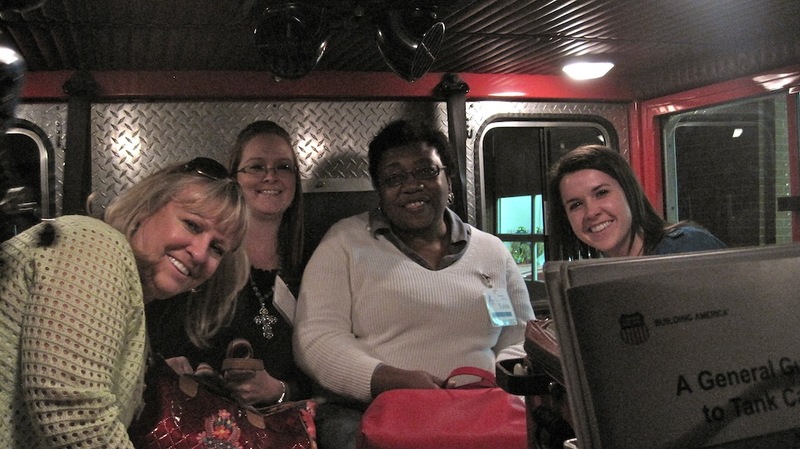 Meeting K-9 dogs and their handlers, and getting a ride in a fire truck! were highlights of February 2014’s City University. We saw a taser demonstration, during the “classes” for that day. Tasers, aka “electronic control devices,” are preferred by officers, to pointedly immobilize a suspect and therefore diffuse a potentially tense situation. They work better than pepper spray, which can drift and adversely affect others nearby. We also heard about the how and why of the SWAT team, which was established in 1977 after an unstable person barricaded themselves and a 16 year-old hostage in a 26 hour stand-off and ended with killing the 16 year-old. The SWAT service covers a 22 county area. We heard about their armored vehicle, used for “concealment and cover issues” and rescuing people from shooters. They spoke about the need for mental health support to maintain the psyche of especially those officers working with children. Evidently this unit is partially grant-funded. Also in relation to children, we heard that there will be an increase in the numbers of school resource officers in the next year or two. The idea of “school resource officers” is so that kids develop a relationship with officers at school — a beat cop idea. The department covers an area of 111 square miles, which apparently is huge geographically. They are also evidently short some positions. We toured first the dispatch/communications area, then the forensics lab & finally the property and evidence storage areas. The dispatch center handles 300,000 calls per year with 29 dispatchers working and 6 superintendents. Per month they receive 2,000 pocket dials to 911. The K-9 dogs were fascinating. We learned about the fact that just the loud, scary barking (and it’s very loud, scary and deep), and the psychological effect of a dog on the scene, is sometimes enough to dispel a bad situation. The dogs have “no hard feelings” against the person they’re pursuing, as it’s “just a job,” and they go back to living with a family with kids and other dogs after they do their work and get their reward toy. These dogs cost $15,000 apiece and are trained in obedience daily, socialized a lot, and apparently make their cost worthwhile with recovery of evidence and finding suspects hiding. Thor, a huge German Shepherd, prefers two tennis balls at once as his reward toy of choice. He chews on them until they pop, and this activity is accompanied by a large amount of saliva. His handler collects up the flat balls from around the Rose Park tennis center so that he has a plentiful supply for training. In other dog-related news, we found out that the fire department did have the traditional dalmatian living at the station until leash laws put an end to that. 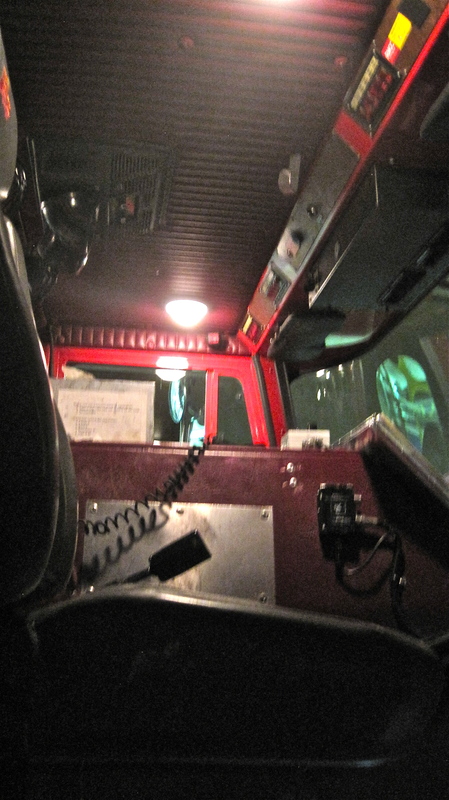 While seated in the front seat of the fire engine, I told the fireman that I felt like I was living out a childhood dream and he said, “I feel like that every time I come to work.” Now that’s a job you should be doing! Our fire department has a Public Protection Classification, Level One which apparently only 60 communities nationwide have. I was impressed with the Fire Chief’s attitude and apparent way of running things. 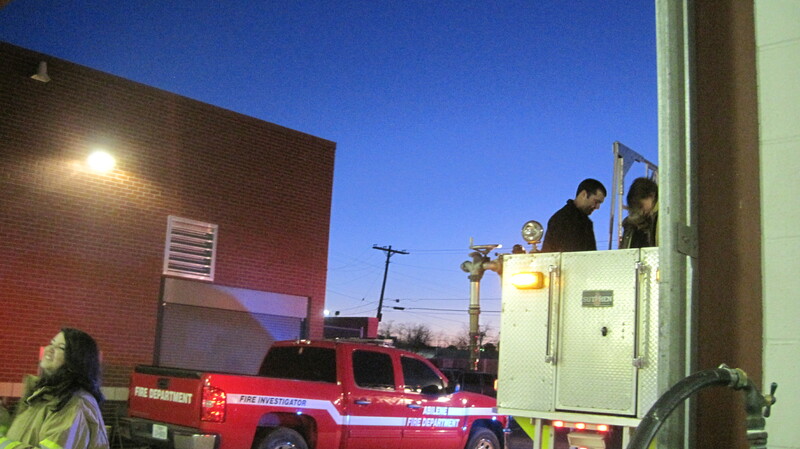 There are 8 fire stations in Abilene, all with a Pumper truck & are EMS staffed and equipped. We heard about gallons and gallons of water. We heard about “amazing” mechanics, with Emergency Vehicle Technician special certifications that mean trucks don’t have to be shipped to Dallas for repairs. Special fire engine siren that cuts through most other noises. We heard about preparation, like getting floorplans of all commercial buildings. And methods of ventilation to use with fire, like chopping a hole in the roof of a structure, opening doors, setting up fans. As far as ambulances, Metro Care in Abilene has an exclusive license for these emergency calls and other companies do non-emergency. Now. 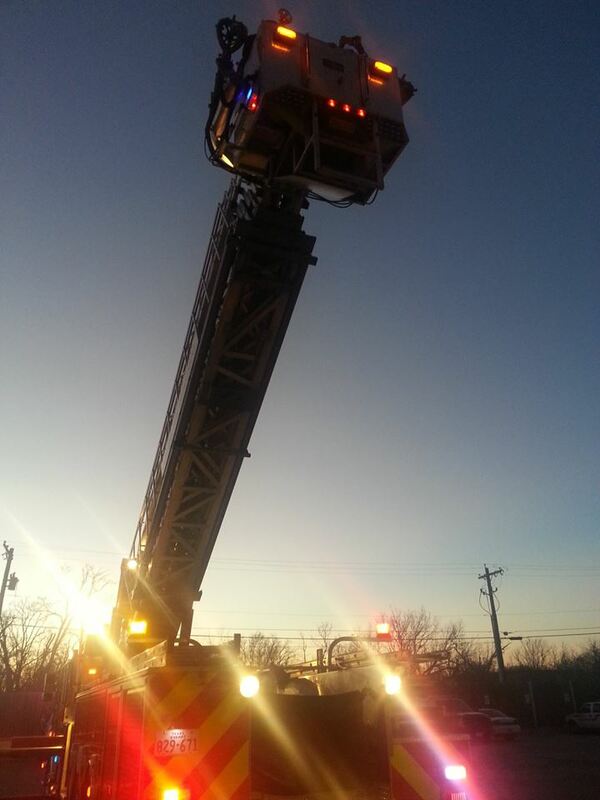 On to the ride in the bucket of a hook-and-ladder truck. This was nerve-wracking. About the fear of heights. I know that we humans can become extraordinarily afraid of anything if we dwell on it enough and it becomes a phobia, but when you’re suspended above the air in a little bucket attached to a very long ladder, I think the fear of heights is a reasonable thing. Our brains say things like, “You’re not a bird, right? Sooo, what are you doing up here?” The wind blows against you, you’re outdoors, you’re not tightly strapped in as you would be on an amusement park ride or inside an airplane. I did not find it very comfortable, and had to fight the urge to sit right down on the bottom of the bucket. But my fellow classmate helped me feel brave just by going up with me, and the fire fighter with us said that yes, even he had to get over the feeling in order to do his job. 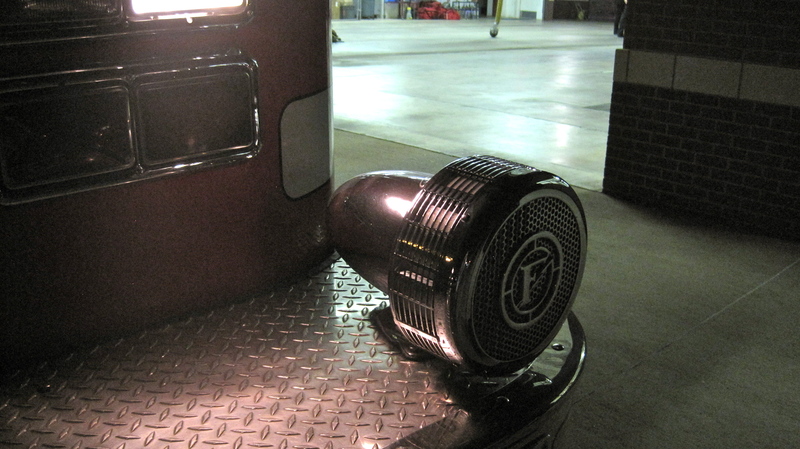 Practicing these kinds of things is partly what they do to continue to be prepared. Suiting up in a fire jacket and walking into the bucket of the truck, then snapping in. Good police & fire departments ~ integral parts of a healthy city.